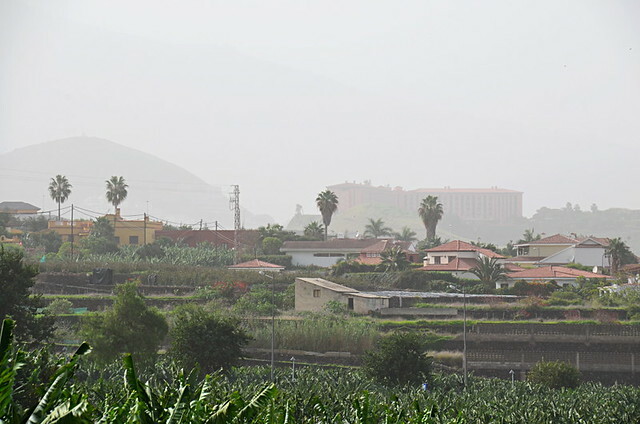 One of the most unusual weather phenomena we experience on Tenerife is calima, when a sand and dust filled cloud is blown over from North Africa. The cloud doesn’t stop here in the Canary Islands, it can travel as far as South America. Calimas can happen at any time of the year but generally they are most common in winter and summer, although it can be difficult to separate those seasons from autumn and spring here. This December (2016), they’ve been a common factor throughout the festive season, the skies hardly having time to clear before they’re filled with particles of dust again. A similar thing happened a few years ago when there seemed to be a calima every Thursday for weeks. 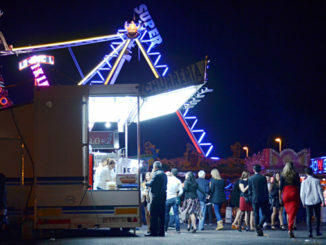 Normally calimas last around three days, but can whiz through in a day or two as well, usually accompanied by gusting hot winds; although at certain times of the year these can be quite cooling winds, as experienced in areas such as the south of Tenerife this festive period. How do you know when there’s a calima? 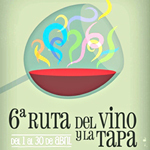 The most obvious way is to check the Spanish Met Office’s weather forecast. They can spot an approaching calima from around 48 hours in advance. If it’s a serious one they’ll issue a weather warning for ‘polvo en suspensión’, basically dust in the air… tonnes of it. Even without Spanish Met office warnings, in theory it’s quite easy to spot when there’s a calima affecting Tenerife. A yellowish haze in the sky blots out the scenery, the wind blows a hoolie and you’ll soon find a layer of dust building up on exterior tables and patios. If you’re susceptible, you might find it feels a bit as if you’ve got a cold as dust particles can irritate the nose and eyes. A couple of times when we were returning to the island we could clearly see there was a calima as we came into land. It tends to only reach a certain altitude so from above there’s a yellowish carpet or band covering the land. However, people who don’t know what to look for aren’t always aware of the signs. There was a difference of opinions on Tripadvisor recently between a visitor who insisted the weather was lovely and an expat who was trying to explain there was a weather alert in place. It was an exchange which revealed quite a lot about the seen and unseen impact of calimas. Someone lying on a sunbed in their hotel complex or even looking out to sea might not even be aware there is a calima, as in the case mentioned above. The horizon might be hazy, but there’s nothing distinct to look at so it’s not always as obvious. It might be breezier, but the parts of the island affected most by calima tend to by a bit breezy anyway so sunbathers don’t always connect it with a weather phenomena. And the temperatures can shoot up. The latter is not something anyone sunbathing is going to complain about. Look inland and it’s not difficult to see when there’s a calima. A yellow fog blots out everything during heavy calimas and creates a hazy curtain during light ones. Saying that, people occasionally get it wrong. I’ve seen cloud described as calima, but I think those occasions are more to do with ‘cloud denial’ than anything else. 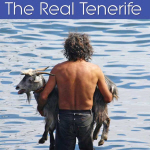 Which parts of Tenerife are affected most? 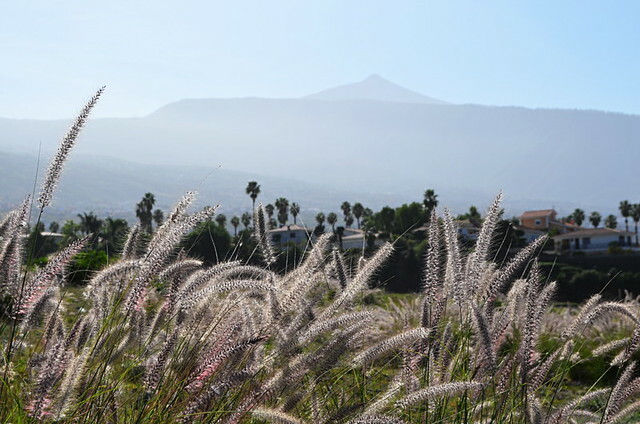 Knowing that calimas travel from North Africa towards South America provides a clue as to which parts feel the effects most – southern and eastern areas of Tenerife. Those areas are where the dust is thickest and the accompanying wind strongest. 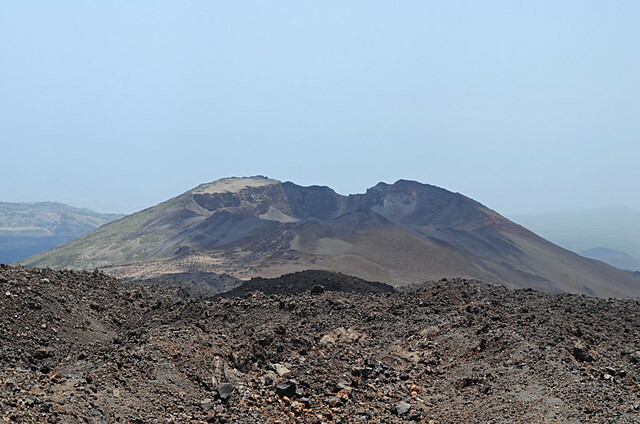 Northern parts of Tenerife escape the worst of the calima thanks to the island’s mountainous spine, sometimes it’s hardly evident there is a calima affecting the island. There isn’t as much haze and often there’s no wind. This Christmas and New Year period provides a perfect example. 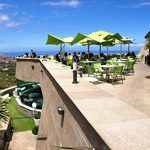 Most of the period was calm and sunny in the Orotava Valley whilst there was an incessant wind in southern resorts. Like any extremes of weather which affect Tenerife, calima isn’t dangerous as long as people are sensible. During heavy calimas people are advised to stay indoors where possible, especially the old, young and those with respiratory problems. Clearly breathing in a lot of dust and sand isn’t good. You certainly don’t want to go walking in the Tenerife hills during calima alerts. The dusty wind dries out plants, which increases the risk of forest fires in summer. A wildfire during a calima is a nightmare. This ‘drying out’ of the land also has an adverse effect on agriculture. It’s said that up to 30% of tomato crops are lost each year because of calima. Calima is the oddest of weather phenomena in Tenerife. Apart from the fact it’s a sandy present from North Africa, it doesn’t always figure on the radar of some visitors even though it’s despised by locals. I once set off on the path to summit of Teide and within minutes was struggling – is this a common reaction there? Why is that building (Taoro) no longer a hotel? In the header of your blog is a picture of a green Caldera – whereis it? Your reaction on Mount Teide isn’t uncommon. 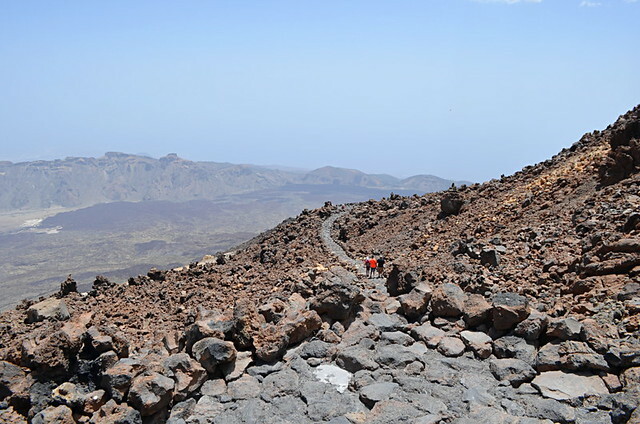 The route to Mount Teide starts at roughly the height where altitude sickness can kick in which affects some people badly. The Taoro has an interesting past. 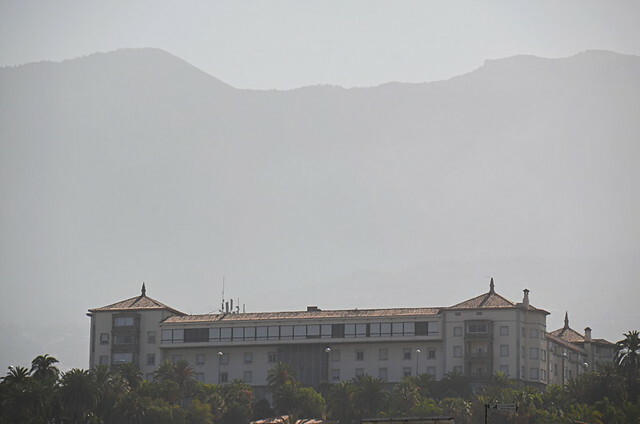 It’s one of the iconic buildings of Puerto, but it stopped being a hotel in 1979 and was turned into a casino until 2007 when the casino moved to Lago Martianez in the centre of town. Since then there have been plans muted every now and again, one to make it a Parador. But at the moment it’s considered the forgotten building. Occasionally it’s been used for special events. I went to a conference there a few years ago. It’s such a shame it lies unused most of the time. 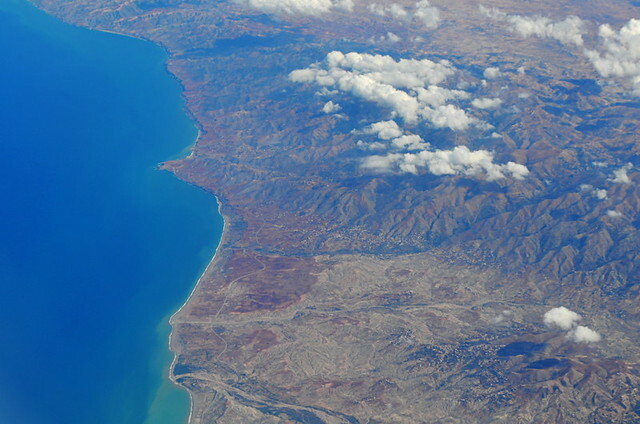 The caldera in the header is the El Palmar Valley in the north west of the island. I’ve never heard that one Frank. Official sources state the sand and dust as coming from deserts and dried up riverbeds where it’s highly unlikely there would be much agriculture and definitely no large scale farming.